This Friday, many shoppers will head to corporate stores across the country for Black Friday shopping. However, here in Franklin County, we like to do things differently by supporting our local businesses and kicking off the holiday season in style with Moonlight Magic. This annual event known across the region will take place in the beautiful village of Shelburne Falls. 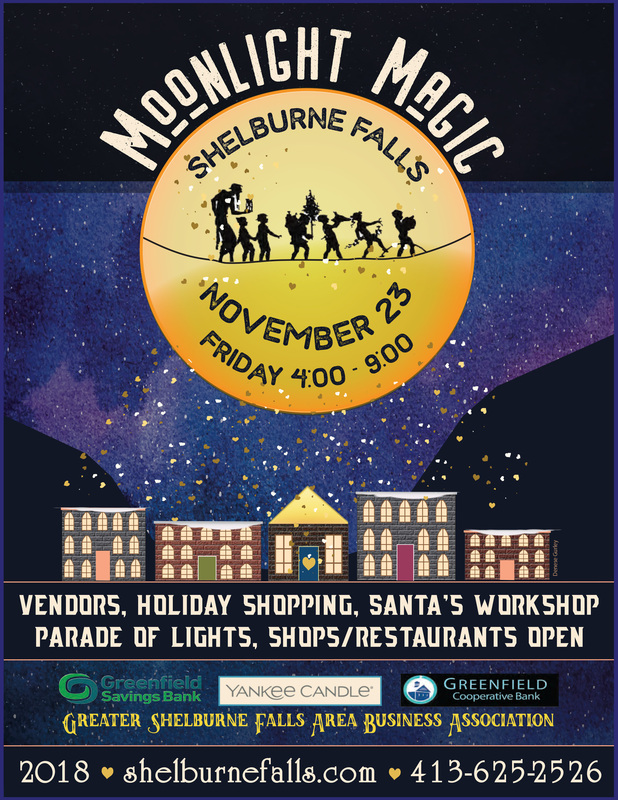 The Greater Shelburne Falls Area Business Association has worked together with local businesses to put on this magnificent event. The village has already been beautifully decorated with holiday lights and garlands spiraling up the lamp posts along with pole tags with sponsors’ names showing their support. On the eve of Moonlight Magic, luminaria will line the streets directing event goers to various points of interest throughout the village. Moonlight Magic is also one of the few times of the year where Bridge Street and Deerfield Ave will be shut down to traffic, allowing pedestrians to wander the streets, browsing vendor tents and businesses, which will stay open later for the event. Soon after sunset, the Parade of Lights will make its way down Conway Street, over the Iron Bridge and down Bridge Street. Santa and Mrs. Claus will be part of the parade, greeting shoppers and then ending at the Mason’s Lodge, for visits and photos. Throughout the event, there will also be various performances, including one of my favorites, the Ageless Waves of Rhythm, Shelburne Senior Center’s drumming group. Moonlight Magic starts at 4 pm, giving you plenty of time to sleep in the day after Thanksgiving! Visit shelburnefalls.com for more information or pick up an event brochure the day of to find out what’s happening around the village.